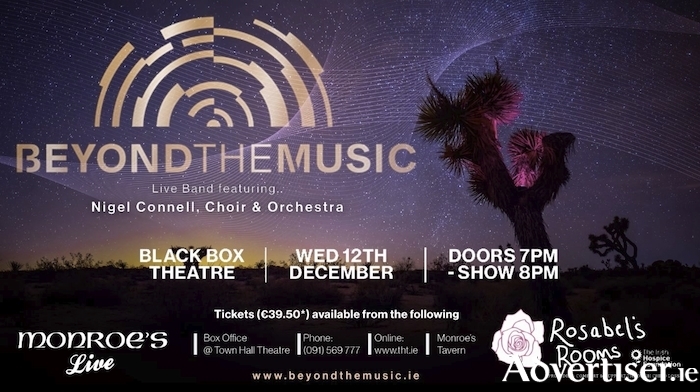 Advertiser.ie - Beyond the Captivating Music of The Joshua Tree - Wednesday, December 12th. Beyond the Captivating Music of The Joshua Tree - Wednesday, December 12th. A very special evening is promised in the Black Box on Wednesday, December 12th. Beyond the Music presents the compelling music of the iconic U2 album ‘The Joshua Tree’. The music is performed by a live band, choir and orchestra. Stunning arrangements and all orchestral parts have been arranged and scored by the creative team and subsequently recorded with the multi-award-winning and internationally-renowned Prague FILMharmonic Orchestra. You will be taken on a wonderful musical journey, treated to the full force of these legendary songs embellished by lush orchestral arrangements and sung beautifully by lead singer Nigel Connell. All hit songs from the original album including ‘With or Without You’, ‘Where the Streets have no Name’, ‘Still Haven’t Found What You’re Looking For’ and ‘In God’s Country’ will lift you in this singular evening of U2 classics. Beyond the music has been formed out of an inspiration to honour greatness. A musical journey and acknowledgement of some of the greatest recording artists and their songs that have helped shape generations. The first project has been to go beyond the music of U2’s groundbreaking album The Joshua Tree. Beyond The Music takes a somewhat deeper look into the subject pieces. By using the power of orchestra to develop the stories and themes playing out in the music. The arrangements concentrate on this focus, stimulating the emotions and senses of the audience member. The Galway show coincides with the release of the Beyond the Music’ album. Proceeds from the Galway show are in aid of Rosabel’s Rooms, supporting families experiencing child loss. Visit www.monroes.ie for more information on upcoming gigs. A Festival of Light and Colour in Galway is set for Christmas 2018! A Fashion Fairytale for Rosabel’s Rooms. Page generated in 0.0695 seconds.